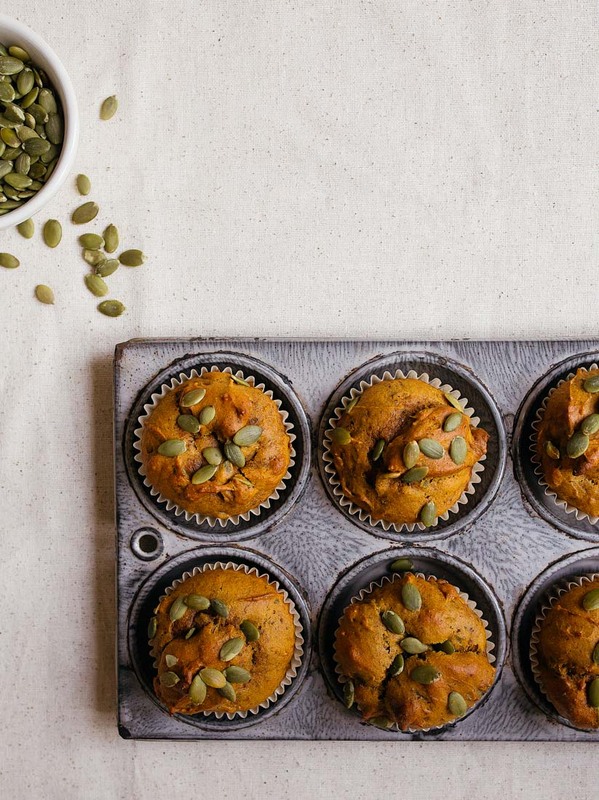 Vegan pumpkin muffins, small batch style. 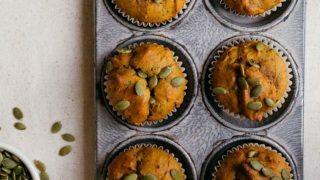 Recipe makes half a dozen vegan pumpkin muffins. You, me and a muffin pan are doing big things these days, aren’t we? I’m half-considering starting a separate blog called ‘Small Batch Vegan’ because I’m having so much fun developing these vegan recipes for you! When I want to eat dessert but feel a little less guilty about it, a vegan one does the trick. Plus, so many of you guys write in to say that you have dairy and egg allergies, and so vegan baking to the rescue! 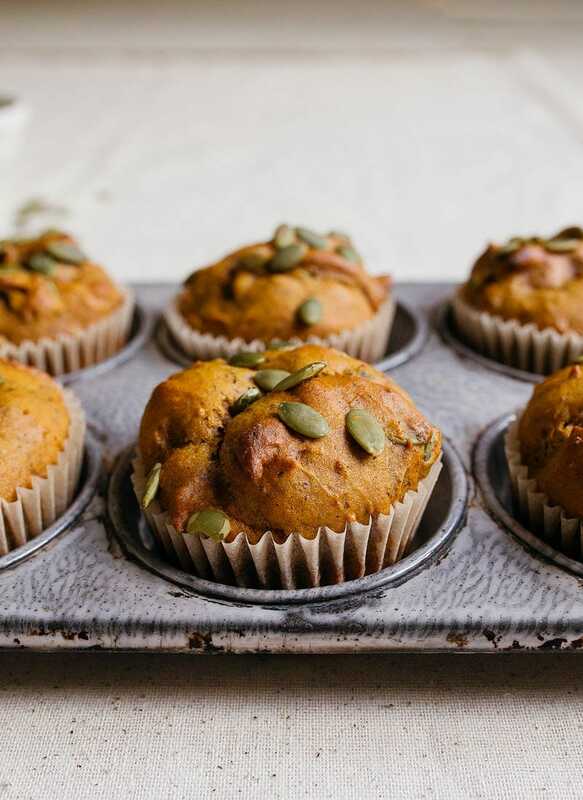 I made these small batch vegan pumpkin muffins almost the same way as my small batch vegan banana muffins. If you like those (and based on some instagram feedback, you guys really loved ’em! ), you’ll love these. They have a full teaspoon of pumpkin spice and a small handful of pumpkin seeds tossed in. I layered a few more on top because they’re pretty. 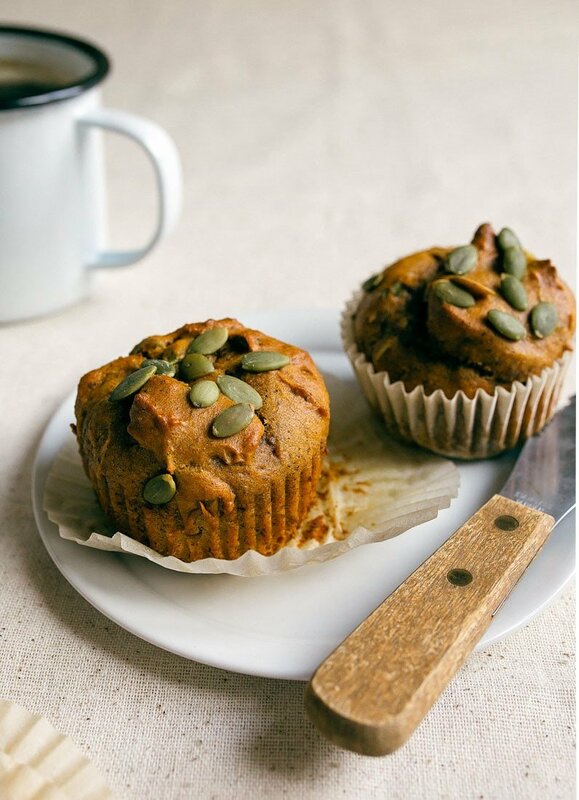 If you want your kiddo to eat them, you might want to lightly chop the pepitas…just a little lesson I learned when I proudly handed my Camille a vegan pumpkin muffin during snack time. She took one bite, and said she’d rather have a banana muffin. I assumed it was the pepitas, and right I was, because I made a second batch without the seeds, and she gobbled them up. I also want to recommend making them into mini muffins if your primary goal is kid snack time. (You’ll get about 12 mini muffins, and they freeze very well). I’m getting ready to test the portability of these when we jump on a plane next week, and I will definitely report back! Side note: I’m currently accepting tips on how to get kids to eat nuts. My Camille will drink almond milk, eat peanut and cashew butter, but will pick out any form of whole nuts both in curries and baked goods. Thoughts? Help! I have a friend whose 15-month old eats chopped cashews, so I know it’s possible. I hope you guys love these vegan pumpkin muffins. Be sure to check out my entire collection of vegan recipes for two, especially my vegan brownies! You don’t want to miss those! 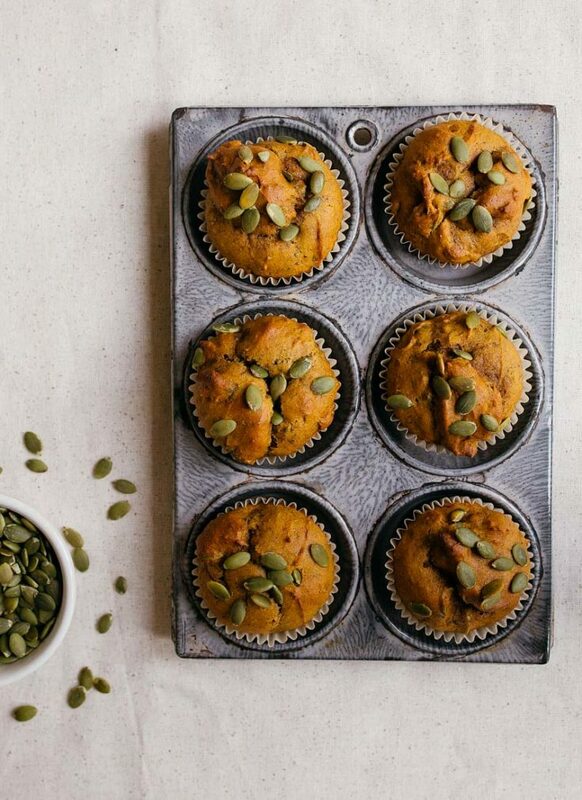 Small batch vegan pumpkin muffins for two. First, combine the flaxseed meal with about 2 1/2 tablespoons of water in a small bowl. Stir well, and let rest for about 5 minutes. Preheat the oven to 350, and line 6 cups in a muffin pan with liners. In a medium bowl, stir together the pumpkin, brown sugar, oil, vanilla extract, and pumpkin spice. Next, stir in the flaxseed meal & water mixture. Sprinkle the flour, baking soda, salt and pepitas on top. Mix very well. Divide the muffin mixture between all 6 cups. Bake for 18-20 minutes, until a toothpick inserted comes out cleanly. Store any leftovers tightly covered on the counter for up to 2 days. Yay! These look great! And if you do a blog called “Small Batch Vegan” I’d be the first reader! (Of course, I need gluten-free also, but I can make those variations). Yay! sometimes I do vegan & GF! Can you fill me in on the gluten free conversion?! I’m guessing she made them using a 1-for-1 flour blend, like Cup4Cup? Personally, I would use a brand WITH xanthan gum. Thank you for all these small batch vegan lil’ treats!! I’m not vegan, and I want to make these. They look seriously perfect! I am loving all the vegan recipes!! Please keep them coming! i have been dreaming of these bad boys since i saw them on your IG stories..i will be trying them when i get home! cant wait, wont wait. delicious! I usually bake vegan, but not small batch! I definitely should – as I eat up eating 24 muffins in 48 hours….not a pretty thing…. Hah, I feel ya, Aimee! Can I use an egg instead of flax seed meal? Yes, of course :) Enjoy! Hi Christina, Baked or steamed pumpkin will also work – in the same amount, right? I have 3 small pumpkins. They were just sitting here waiting for your recipe. Thanks a lot! Ohhhh, Marianna, I’m a tad worried because homemade pumpkin puree typically has more water than the canned version. Is your pumpkin the same thickness and texture as canned pumpkin? I just don’t want you to have a failure with this recipe! Thanks a lot! I am sorry, I posted the question again, I couldn’t find my comment. I never got canned variety, but I thought I’d be safer just steaming it and making ‘mashed pumpkin’ instead of proper puree. Thank you for the small batch! Are you vegan? You can use 1 large egg. Or, an egg made from chia seed. Yes, please continue with vegan recipes — our daughter has been having dairy issues out of the blue lately, and seems to be ok eating vegan! Thank you! Can I use mashed pumpkin instead of a can? Same amount approximately? Thanks, Christina, for a great recipe, and a reasonably small batch. I just made these. My husband loves them! They’re so easy and so good. Thank you so much for sharing your recipes. Hi! About your daughter and nuts. It could be a texture issue. We experienced this with our daughter, and it was a VERY long time before she was willing to eat anything outside her texture comfort zone. Perhaps cutting the nuts really small might help – not so much to hide them in food as it is to reduce the feel of the nuts in her mouth. That never worked with my daughter, who wouldn’t willingly eat anything that didn’t have the texture of al dente pasta or chicken nuggets. We were able to get her to eat breaded shrimp – and it was that event that confirmed for us it was a texture issue. Made these last night and boyfriend loved them! I was skeptical of the texture before baking but they came out perfect! Have you tested your muffins with part or all white whole wheat flour? I will try it as written first but I have a bag of King Arthur’s WWW flour to use. :) Love your blog and Instagram! I clicked on “Print This Recipe” seeing the photo in the upper right hand corner. I was so disappointed to discover that the photo was missing when the recipe actually printed. Is there a way for you to correct this? The photo is what inspires me to make the muffins!